In a piece for New York Times, Monyetta Shaw, Ne-Yo's ex-fiancé and mother of his two oldest children, wrote about the pain she felt after agreeing to have her tubes tied at Ne-Yo's request, saying Ne-Yo was supposed to undergo a sterilization procedure as well only to find out he never went through with it. Excerpts from the piece written by Monyetta for the NY Post after the cut. On Oct. 9, 2011, I delivered a healthy baby boy, my second child, Mason, and I finally felt my family was complete. So before the doctors finished up in the delivery room, I told them: "I want you to burn my fallopian tubes." My fiancé, Shaffer Chimere Smith (better known as R&B artist Ne-Yo), was right by my side, holding my hand the entire time. The doctor must have asked us eight times if this was what we wanted. Each time, we both replied yes. 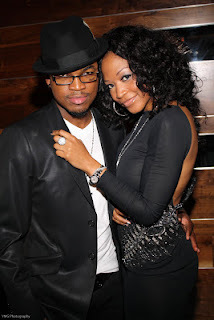 Sterilization was something Ne-Yo and I discussed thoroughly in the months leading up to the baby's delivery. We had a daughter, Madilyn, in 2010, and two children seemed like more than enough for the both of us. Ne-Yo also agreed to undergo a vasectomy to show our mutual commitment to the relationship. We first met in 2009 at a Jamie Foxx concert in Louisiana. He asked me out several times before I said yes — and then I fell for him fast. He had such a good heart, and that's what attracted me to him. The next year, I found out I was pregnant. It wasn't a complete surprise, as we weren't using protection, and we knew instantly that this child was a gift from God. After starting a family, I fell more in love than ever. In 2010, during a weekend in the Dominican Republic for [rapper] Fabolous' birthday, Ne-Yo asked me to marry him. We were in a suite, and he told everybody to be quiet. He pulled my hand, dropped down to one knee, and I immediately started crying. He incorporated the lyrics from his song "Make Me Better" and pulled out a 10-carat diamond ring. In 2011, I found out I was pregnant with Mason. This time, Ne-Yo wasn't there a lot. Our home base was in Atlanta, but he spent most of his time working in Los Angeles. I told him, "Our family should be in LA with you," but he was adamant that his family grow up in Atlanta. I would travel to see him sometimes, but as the pregnancy progressed I could no longer fly. But he was there for Mason's birth, and gave me a high-five in the delivery room. Immediately after, the doctor performed the sterilization procedure. I had no regrets. I was so busy caring for two young children, I just assumed Ne-Yo had followed through and had gotten the vasectomy. I trusted him so much that it never even crossed my mind that he hadn't gone through with it. But then, in June 2013 — just two months before our August wedding — Ne-Yo called. "I don't want to be monogamous anymore," he told me — in other words, he wanted to break up. A week later, we had a deep conversation face to face. I was so hurt and distraught; my parents have been together for 44 years, and I always assumed our relationship would last for the rest of our lives. The thought of him and my kids not living under the same roof was devastating. A week after our split, Ne-Yo posted the news on Instagram. It wasn't long until VH1 producers called and asked me to join the reality show "Atlanta Exes," which followed me along with other ex-wives of Hollywood stars, such as Tameka [Foster], Usher's ex. Then, in 2014, when Ne-Yo released his music video for "Money Can't Buy," I found out that he was dating the video's vixen, Crystal Renay, known for posting racy photos on Instagram. My world came crashing down all over again: I had tried to understand that he didn't want to be monogamous, but then he went and found a different woman whom he was ready to be monogamous with? It hurts to see them parade their love on social media. They recently married, on Feb. 20, and Crystal gave birth to their first son. She seems like a nice girl, but I would be worried if I were she. How does she know that he's not going to do the same thing to her that he did to me? Adding to the pain is knowing that if I find another man to love, I may not be able to start a family with him. I'm too scared to go to a doctor to find out if there's anything they can do about it. Because I do want to get married someday, and if my future husband does not have kids, I will want to have his children. Despite all of the hurt, there has been one bright spot. I've had so many women reach out to me via social media, pouring their hearts out about similar regrets. I'm glad that I've been able to counsel some of them as they navigate their own hardships. Now I look back and wonder what I was thinking. I love hard, and I made so many permanent decisions based on what I thought a man wanted from me, not what I wanted for myself. When my daughter comes of age, I will tell her: "Your body is your temple. Don't do anything to it you don't want to regret." Today, I'm finally at peace. I took awhile to get here, and I don't know if I'll ever be exactly where I want to be, but I make the choice each day to be happy, not just for me, but for my two kids. That's where the title of my book comes from — this is all bigger than me.